Week One of our Sizzle into Summer Challenge has commenced for our staff! Each of us are undergoing Zerona or LPG body sculpting treatments along with following three different types of meal plans. Zerona is the first non-invasive, FDA approved, body contouring laser on the market. Many of our clients see an average of 9 inches lost in 2 weeks of treatments. Treatments last 40 minutes and are administered every other day. LPG treatments are hands on, and feel closest to a deep tissue massage. The LPG machine massages your fat to help breakdown the fat cells. Combined with the Zerona laser, many of our clients have seen 18-24 inches lost in a two week period. Both treatments can be done without any change in diet, however we offer several choices to help increase inches lost through Registered Dietitian approved meal plans, shakes for those on the go, or needing a quick solution, and a 10 day cleanse for those who have had many toxins or digestive issues. Which would you like to try? Go to www.firstcoastwellnessjax.com to learn more! While we aren’t all going to compete in the Olympics this year, you can never out train good nutrition! Get the same Sports RD experience as in these videos with our board certified sports dietitian, Mindy Black! go to www.firstcoastwellnessjax.com! Zerona is the first FDA-approved, non-invasive body contouring procedure to effectively remove excess fat without the negative side effects associated with surgical methods. 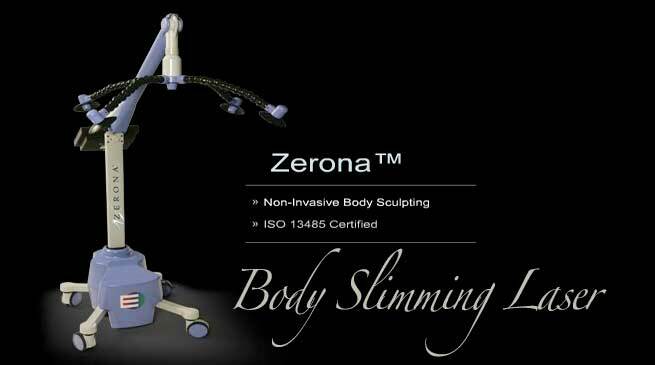 Zerona utilizes cold laser technology which has been shown to emulsify fat and allow it to move to interstitial space. The Zerona cold lasers provide patients with a safer alternative to surgical procedures, which can result in bruising, swelling, and damage to other tissues. There is no need to wear compression garments or bandages with Zerona and since there is no pain, there is no need for anesthesia. Unlike other non-invasive approaches, Zerona low-level lasers do not rely on heating tissue, which can cause discomfort. There is no downtime, so patients can resume their normal activities immediately. The cold laser technology behind the Zerona procedure has been shown to release the cellular contents of fat cells while leaving the capillaries and other cells within the interstitial space. Prior to laser exposure, fat cells have a regular, cluster shape (think grapes). Within minutes of low level laser exposure, fat cells begin to develop transitory pores. This pore allows the evacuation of the cell’s contents into extracellular space. Once the contents of the fat cell have been emptied, they are released into interstitial space where it can be passed through the body during its normal course of detoxification. The cells then take on a deflated shape (think rasins). Although this technology was originally utilized to help assist liposuction procedures, it was found that the cold laser treatment alone helped patients to reduce an average of 3.64 inches from their waist, hip and thighs. Treatment with the Zerona laser is easy, painless, and carefree. Each session takes 40 minutes and the minimum suggested treatment period is two weeks, with three full sessions each week. You simply lay in a comfortable, stationary position while the Zerona does all of the work. Since the Zerona uses cold laser technology, you feel nothing during the procedure. Ultimately, the treatment with a Zerona laser is a stark contrast to traditional methods of fat reduction procedures such as liposuction and gastric-bypass surgery. With Zerona, you can simply lie down, relax, and let the laser do all the work.